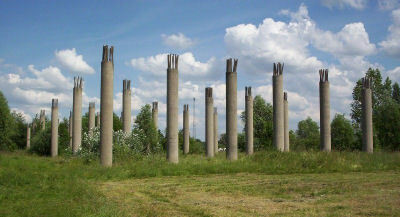 The Olimpijka was a planned east-west motorway across Poland, part of a highway connecting Berlin to Moscow originally expected to be opened in time for the Moscow Olympic Games in 1980. Although some initial work was started, the project was evenutally abandoned. This unfinished bridge near Baranów (Masovia, Poland) is in the middle of nowhere. The bridge was intended to cross over the northern part of the Central Mainline Railway which also was never built.